“You know those custom Lululemon bags? Can you do those for me?” This is probably one of the top questions we get asked—true story! Bulletin Bag [.com]’s answer has always been, “YES! 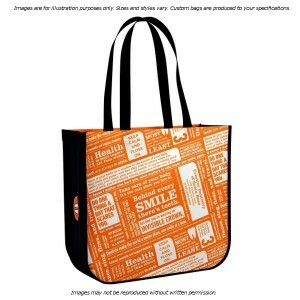 !” Now, however, it’s even easier to get started on your own project with the addition of 9 new custom bags with all over printing! 1. They are completely custom-made to order. From handles to size, and of course the all over printing, these bags are designed and made exactly how the client wants them. 2. They are ordered in huge quantities. Reusable bags like the custom Lululemon bags are ordered in quantities of 10s or 100s of thousands per order. And the larger the quantity, the lower the per-bag price is. This is why the customer can get them for free or low cost at stores. 3. But the process takes time. The lead time for custom bags with all over printing is three months. Why? They’re made overseas and involve a lengthy process of checks and balances to make sure the finished product is exactly what you were expecting. 4. If a provider tells you they can produce a bag faster than this, proceed with caution! This is a red flag that indicates inexperience with the process—or a sign of someone who will make time commitments they may not be able to fulfill. It’s extremely important to allow enough time for approval of e-proofs, preproduction samples (an actual printed sample bag), shipping, and customs clearance. 5. It’s not confusing or daunting to create a custom bag with all over printing. We promise! However, because the process is so complex, it’s critical to choose a company (like us!) that has experience in producing these types of bags. We have the knowledge and expertise to attend to every detail, and will work as your partner to make your bag concept a reality. Is all of this worth the end result? You know the answer…because you ask for custom Lululemon bags by name! Price Range: $0.99 – $1.70Minimum 2500 pcs. Price Range: $1.13 – $1.85Minimum 2500 pcs. Price Range: $1.78 – $2.32Minimum 150 pcs. Price Range: $2.22 – $2.88Minimum 150 pcs.